Our electronic lockers are intelligent and based on microprocessors. We provide password controlled locker systems that work with or without key. Equipped with in-built power backup, our lockers are the safest option in the industry. Simple to install and run, our lockers promise easy operation at all levels. In addition, we also offer single wall or fireproof double walled lockers. External Dimensions(mm) H210/W430/D460 Internal Dimensions(mm) H148/W332/D348 Internal Volume approx. 9.17 litres Weight approx. We sell fireproof safes in varying storage capacities ranging from size 28" to size 72" All our safes come with many features. We have the privilege to offer a comprehensive range of Electronic Safe that is available in different models and sizes. These are equipped with set usage period, electronic control unit and audit trail - record last 100 Ops. 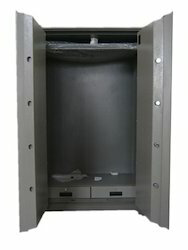 Moreover, these safes are credit card enabled, fire resistant and are used in motorized hotels and are fire resistant. Available with us a range of precision engineered, reliable and burglar resistant safe lockers that are procured from reputed vendors. We are a trusted dealer of safes that are designed to offer ease of operation, high security and robust construction. Available in different specifications, these find wide application in commercial and residential establishments. ATSafe - Strong Room Door - 6.5' X 3'.